Scheduling a telephonic interview is easy and employers consider it to be a great option when candidates staying far off are to be interviewed. Yet there are several drawbacks in a telephonic interview and unless the interviewer is really focused, he cannot hire the right candidates. When you have the candidate right in front of you, your chances of getting distracted are less. That is not the case in telephonic interviews. In these, you need to be really focussed to hire the right candidates. The right telephonic interview technique or procedure is elaborated below for the employer’s reference. Following the step by step procedure of all the mentioned guidelines will help you behave like an experienced employer. As an employer, you need to keep in mind that the candidate could be tense and nervous for the telephonic interview. You must thus start off by introducing yourself. Once the candidate gets acquainted with you, it will be easier for him to answer the questions you pose. Your introduction should tell the candidate the position you hold in the organization, your name, your qualification and a few details regarding the company. This will help the candidate understand the organization better. You must keep the introduction short and professional. You need to know the candidate you are interviewing and this can happen only if the candidate gives a short introduction. Usually candidates reveal their qualification, experience, hobbies, interests and the reason why they wish to join the new firm in their introduction. You will be able to make out if they are nervous or scared by the way they introduce themselves. If you wish to know some other details regarding the candidate like the place where the candidate resides or what the candidate’s background is, this is the time to interpose such questions. Candidate’s introduction is the time you get to know maximum about the candidate. Most interviewers phrase their questions poorly and thus do not get the facts they actually wish to know. You need to be extra careful while phrasing your questions for telephonic interviews. Do not ask general questions or questions to which there could be more than one answer. For instance, if you ask ‘Tell me about yourself?’ , the candidate has countless things to tell you. If you wish to know about the qualification, phrase the question as ‘Tell me your educational background?’. This is more specific and to the point so you get the exact answer that you are looking for. A great idea would be to prepare a list of questions that you wish to ask to the candidate. Spend time to evaluate whether the questions have been properly phrased. You may have to rephrase certain questions in the list but finally you will get a list of the best questions prepared before the interview. During a telephonic interview, there are many chances of you getting carried away or distracted by some topic. This can hamper the entire scheme of the interview. You need to make sure that you do not get distracted by any topic while taking the interview of the candidate on the telephone. Usually people tend to lose focus when other topics of interest pop up during the conversation. An employer fails to cover all the vital points in the allotted time when he diverts from the main subject. 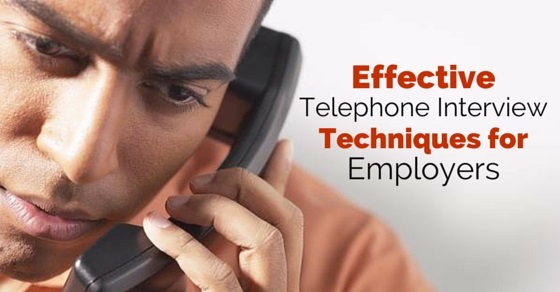 Employers who are accustomed to conducting telephonic interviews are aware of this fact. If you are still not experienced in this field, you may use a checklist of the main points that you need to cover within the time scheduled. This is the first quality that every candidate should possess. While it is difficult to identify whether a candidate is confident or not on the telephone, you may look for signs or sighing or gasping while making a telephonic conversation. These are signs that the candidate is not confident and is nervous while answering to your questions. You may have an idea of the qualification of the candidate from the resume sent to you. Yet, there are some additional skills that may be required in certain fields. If these have not been mentioned in the resume, ask them on the telephonic interview. For instance, some graphic designing job profiles require you to know Indesign or other specialized software. You need to ask the candidate whether he has learnt the use of these software so that you can be sure whether the candidate is eligible for the job position. The candidate must respect work and possess certain basic work ethics. He needs to respect deadlines. These are again factors that you cannot gauge in a single telephonic interview. Yet you may ask the candidate how good he is at working within tight deadlines. His attitude while he answers such questions may give a hint to his true work ethic. You may also ask the candidate what his ideal work environment would be. Try to find out what kind of work culture he idealizes. It will help you make a right choice of candidate. All employers look for candidates with good leadership skills. If you are interviewing a fresher, try to find out the events or functions the candidate may have organized during school or college. It will give you a hint to the candidate’s leadership qualities. Ask the candidate whether he has ever lead a group to achieving certain goal. Candidates who have prior experience of leading a group are sure better leaders than complete freshers. Working in a firm or an organization is no easy task. Most organizations and firms work in hierarchies and the projects completed are often a team effort. Individuals who have worked in teams are better able to adjust when they join big firms or organizations. Try to find out whether candidate possesses team spirit and whether he is capable of working with team members. You may ask the candidate how good he is as a team mate. He may not be completely honest but you will surely get a hint whether the candidate is happy working in a team. Just possessing the right certificates does not make a candidate knowledgeable. You need to assess and see whether the candidate possesses knowledge regarding the field. This can be done by asking questions relating to the core subject. Like for instance, if you are hiring a mechanical engineering candidate, he should be thorough with laws that govern beam strength or buoyancy. You may ask a few questions on these topics and see whether the candidate answers satisfactorily. Knowledge can only be tested by asking basic questions. It is possible that a candidate may not be an expert so he may not be able to answer complex questions. Yet he needs to be well versed with the basic fundamentals of a particular subject. Employers often presume that the conclusion of a telephonic interview session is not significant and can be neglected. This is not true. You must remember that as an employer, the reputation of your firm also depends on the way you present yourself during the telephonic interview. It is best to prepare well in advance how to conclude your telephone interview. You may add a few famous quotations and impressive sayings to conclude the telephonic interview in style. You must also include a few words on what you think about the candidate’s performance in the day’s interview. What are the job timings? Do you have weekend off? When is the increment expected? How much is the starting package for freshers? Do you have a bond? How many leaves can I take? If you are well prepared to answer these queries of candidates, you will be able to win the confidence of the candidate. Employers need to be completely focused and understand the responsibility they are shouldering. It is possible to hire the right candidate even through telephonic interview if the employers are well prepared for the ordeal.